♦ TODAY! Wednesday, Jan. 10 – POSTPONED UNTIL Tuesday, Jan. 16 – Stephen-Marc Smith Exhibition, Gallery Space, D271. Exhibition opens to the public from 4-7p.m. Light refreshments will be provided. 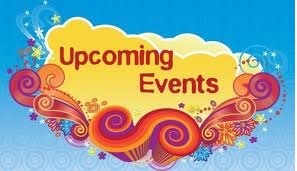 Visit the Gallery Space web site for more information. ♦ Thank you to those who have sent in their syllabi. For those who haven’t, please send your CANVAS syllabi links to Janis Juarez after marking them public, or submit them through the Request Center, or in an e-mail to me. *Please send all ELI and BaTS CANVAS Syllabi links to Seda Markarova. 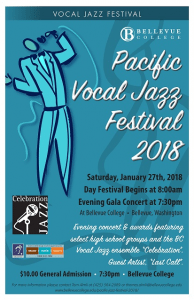 ♦ Saturday, Jan. 27, BC Vocal Jaz Festival Gala Concert | 7:30 p.m., Carlson Theatre | Tickets and additional information available through Brown Paper Tickets. 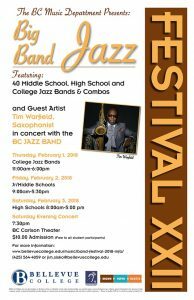 ♦ Saturday, Feb. 3, BC Jazz Band Festival Gala Concert | 7:30 p.m., Carlson Theatre | Tickets and additional information available through Brown Paper Tickets. This entry was posted in Uncategorized by Janis Juarez. Bookmark the permalink.